refGuides plug-in is intended to improve and speed up architecture modeling, or any case where precise measurements are needed. It allows to create construction guides, for accurately position and model objects. 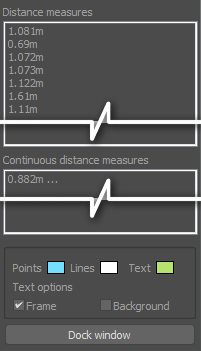 This guides can act as rulers, displaying custom measurement units in the viewport. The main functionality of this toolset consist in the creation of two types of reference objects : linear guides and protractors. Another feature is the ability to place intersection marks where linear guides intersects in space. Use this feature with the Intersection points option, or holding the ALT key during placement. This mode place a guide by determining a direction from two points. Pick a base reference point. Pick a second reference point determining the direction of the guide. Pressing SHIFT will lock the tracking to orthogonal coordinates. Pick a reference point, it will act as a center of the orthogonal space. Move the mouse around to change the direction or snap to a point. Press CTRL during axis selection for Z axis restriction. Pick base point. A circular gizmo displays in the viewports, representing a construction plane. Rotation point 1: Pick Z axis gizmo rotation reference point. Rotation point 1: X or Y axis rotation points. Press ALT while tracking any gizmo rotation to snap angle values. Press SHIFT to change direction, CTRL to change axis. Rotate the mouse around to select the angular component. “Polar mode angle” option sets the angular increment. It’s accessible from the ribbon, the UI creation mode or the Options dialog. Press ALT during last placement tracking to override intersection points ON/OFF setting. The tools have a “continued creation” mode for placing more than one guide in one action. Tool for displaying and snapping angular values. The same placing methods described for the reference line tool are available for the protractor, a exception of the UI mode, since its included in the guide line UI. This feature allows to place reference point, acting as a snapping mark, where the reference guide lines intersects in space. Line guides have two parameters: Units and Extension. Units provide a subdivision scale for the guide. Used to snap objects to, or as a measure ruler. Extension determines how long the guide will be. 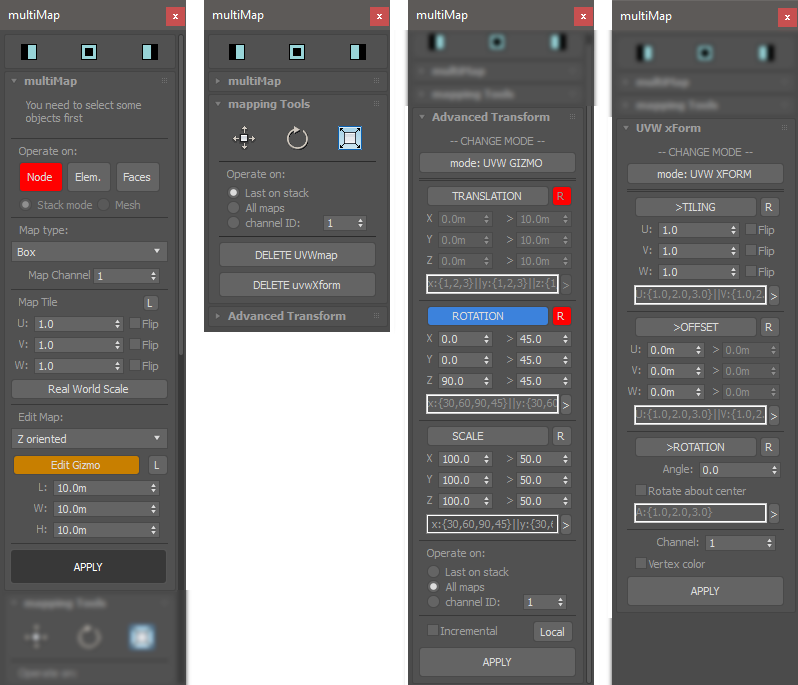 The UI option for the creation modes shows a floater with the general settings for the guides, protractor placement and intersection points option. 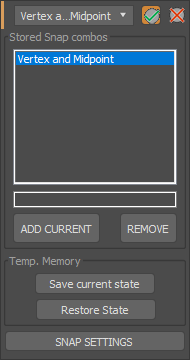 Right clicking on the dialog pops up a context menu with more options. Live info: Display units for the current selected guide. Live info+: Display units for all the guides in the current view (skips hidden or isolated guides). Delete all guides in scene. Home grid size: Displays a reference gizmo with 3 rules towards the XYZ axes indicating the Active Grid spacing units. Provides settings to change the guides color, layer name, intersection points behavior and object type. [*] Custom Object mode (On by default) is only available for 3Ds Max 2016 and up. Smart intersection mode will consider any planar shape on the scene as a guide. While resource consuming, it can place intersection points on imported CAD drawings. for example. First, select the object you want to rotate. Pick base point. this point will act as rotation center. Pick point for rotation axis. Rotate from line (Pick reference point). Move mouse to set rotation angle and direction. Snap to point or press SHIFT to lock angle steps. Reference rotation has two alternative modes: Default mode: The rotation will take place in a temporary coordinate system, defined by a work plane. Free mode: Rotation is not restricted to a temporary coordinate system. Track rotation angle and direction. Press SHIFT to restrict angle steps. Used to scale an object with a reference length to stretch and a target length; works as a 4-point scale method. > First, select the object to scale. The tool works picking two reference distances, one representing a reference length to stretch up or down, and a second one representing the new distance. Pick Base point. This point will act as base for the operation, also marks the original length start. Pick second point for the original length line. Note that the direction of the line will be the direction of the operation. pick Base point for the reference length. pick End point for the reference length. Pressing SHIFT while tracking second points will restrict the lines to Orthogonal space*. Pressing SHIFT When activating the tool will keep the objects proportion for the scaling operation. Normal: Operation done in world space. In context: Operation done in local coordinates. Xform: Instead of direct transformation, it applies a Xform modifier to the target object. Real world units scaling in a direction. Change object’s height, length or width (or proportional length-width etc..) to a desire dimension. Select the object and pick a base reference point. Pick reference distance / direction end. Pressing SHIFT while tracking second point will restrict the direction to orthogonal space*. Set new dimension on the Dialog UI. Incremental option will add / subtract the value form the former distance. Pick an Origin point for the movement trajectory. Incremental mode will change the target point to the Origin point instead of the default End point. You can use this tool in editable poly mode, selecting the sub objects to be moved first. Select an object to operate on. Activate the tool, a dialog will open. Pick a center object. Clicking on the colored slices of the dial will move the object X degrees around the center object. Rotate itself option will rotate the object over itself the same amount of degrees. The Clone object option can will clone the object with each angular movement, making circular arrays. Use Custom angle and the CW (clockwise) or CCW (counter clockwise) for any custom increment instead of the predefined 45° multiplies of the dial. LOOK AT Will apply to the object a look at animation constraint, keeping the object always “looking” at the center. Sets reference points between a reference distance. Move the mouse towards the start or end point to set segments amount. Press SHIFT while tracking second point for orthogonal mode. Using “Clone between” mode, pick the object to clone when prompted. You can use the Divide distance | input mode tool to type the subdivision steps instead of mouse tracking. Note: Orthogonal tracking (SHIFT) has a axis-lock feature: Keep SHIFT pressed, and having vertex snap activated, move the cursor to a vertex and press CTRL, the tracking will be restricted to the nearest axis, and then you can track any point, the line will lock to that specific axis. This feature works in all the tools that has a orthogonal tracking feature. Live visual feedback measure tape. Pick an end point to measure again. A tape for each measurement will remain displayed until tool exit. After picking the first point, press SHIFT to restrict the tape to XYZ axes (orthogonal mode). The result of the last measure will be copied to the clipboard and each measure is traced to the listener after finishing using the tool. The alternate tool **Distance continuous** displays one concatenated tape with all the measures. 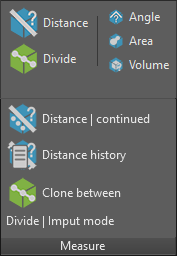 Having the “Distance history” dialog opened while using the measure distance or continued distance tools will record the taken measures, allowing to re-display them and customize the appearance. Pick first reference point to mark a direction vector. The tool will track the angle comprehended between the first direction vector and the current mouse position or vertex snap (with center at the base point). Pick second reference point to end. Start picking points to draw an enclosed polyline. Press right click to finish the measure. The result is traced to the listener. Orthogonal mode is available for the measure tool, press SHIFT between point picks. Cubic volume measure tool. It’s not restricted to selected object mass, instead is measured as an empty space container box. Pick two points representing the start and end point of a box diagonal line. The measured volume of the box will be traced to the listener. While there already are tools available to reposition an object’s center pivot, this one groups them in a convenient UI, that pops down from the toolbar or ribbon button. LEFT CLICK on any button to keep the UI open, or RIGHT CLICK to instantly close it. CENTER, TOP, BOTTOM: Most common operations, can be used directly from a dedicated macro. Top corners / middle / bottom corners: Box model reference locations. A B C D buttons represents a corner point. 3 PNT: Position pivot from three points (base point > Y axis > X axis) keep SHIFT pressed to flip Z direction. This also can be used to set a Working Pivot. FACE: Select an editable poly face and puts the pivot on its center, aligned to the face normal. RESET PVT: Resets the pivot to its original location. RESET XFRM: Shortcut for the built in reset object Xform. Isolate / unisolate selected object and set an active work grid with it’s local coordinates. Note: If more than one object is selected, Local isolate will use the first object in the selection to set the grid. Replace any node with an instance or reference of another source node. Pick nodes to be replaced. SHIFT while picking objects will create a reference. By Default, replicator will keep the original node material and transformation. to replace the transformation, activate the checkbox in the ribbon or the check button macro. Note that the original position is always maintained. Multitarget toggle will disable multiple targets. 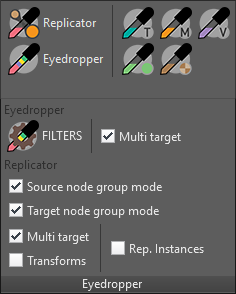 Note that, Eyedropper will replace any matching or similar property, regardless of the node class. 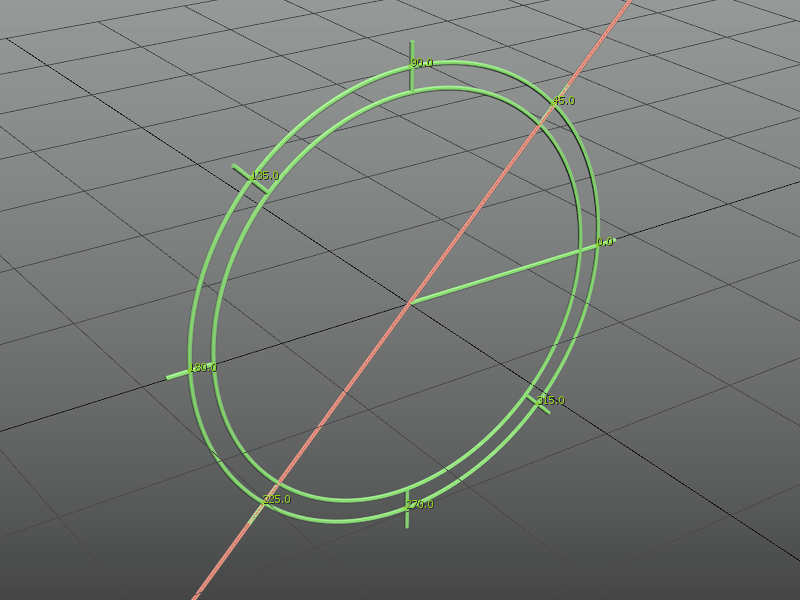 I.E: You can copy the diameter of a circle shape to a sphere object, and so on. UVWmap copy will copy applied UVW modifiers and attempt to copy direct mesh mapping, so if a editable poly or mesh is collapsed, there is a chance their mapping coordinates will be copied. Select the object to clone. Pick second point to define a rectangular area. Move the mouse away from the last point to select the amount of rows. Press left click to finish selecting rows. move the mouse again to define columns quantity. press click to finish. Rows and Columns: Set the amount of rows and columns for the array. Array dimension will be nRows x nColumns. (nColumns per row). Checking “Totals” for Rows and Columns separation will use the XYZ values as total distance for rows or columns extension. Interactive mode allows to set the array dimension parameters in an interactive way, from the viewport. Set a row number in the spinner to add rules to. Press “update Row” if you change the offset parameters for the current selected row number. unchecking “Enable” will turn off the current row, but it’s still used for calculations. Set current column for the row. Each added rule will “fill” a cell in the row. 2.1 Pick the node to use. 2.2 Set offset, rotation and scale values. unchecking “Enabled” will left a “hole” in the array, without breaking the rules. Once you finish to set the new column, or update the current selected row, press “ADD/UPDATE”, check in the listview if the rule was successfully updated. Note: The preview needs to be updated after making changes to the rules. This tool will temporally display all hidden objects (and hide visible ones). Select the ones you want to unhide and Press “Done” on the floater. This tool will temporally display all frozen objects (and freeze visible ones). Select the ones you want to unfreeze and Press “Done” on the floater. Convenient shortcuts to enable / disable standard transformations locks on the current selected objects. Create a grid of panels (boxes or custom geometry) in a planar surface. Originally intended to fast model furniture cabinets and add handles, now is a multi-purpose tool. Uncheck “Box” and pick an object if you want to use a custom geometry for the panels. Invert Object H/W flips the front facing side. Set Grid subdivisions each cell corresponds with one panel. Specify the thickness for the panel. The checkbox next to the spinner will disable custom thickness for reference object mode and use the original height instead. Add Chamfer (3ds Max 2016+ version restriction) will add to each panel a Chamfer modifier. Select the Panels (or objects) you want to add the features. The list on top will change dynamically showing the selected objects. Use the <- button to reset the selection. Pick a detail (feature) object. XYZ displacement from base object center. Mirror: Will mirror objects following the selected rule. note that the indexes correspond to the object’s order in the selection list. ODD and EVEN: Mirror odd or even Nth in the list. List: type comma separated individual objects numbering or use score symbol to set a range of objects. Re-center pivots is intended to address situations where the detail object has a displaced pivot from its center, or to correct misplaced pivots in the result. Fit, center, reset UVW gizmos (this tolls are only available by default through the UVWmap modifier in the command panel, they where written from scratch ) and delete UVW or UVWxform modifiers in selected objects from a convenient dialog. 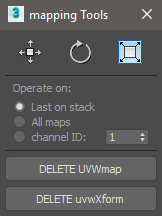 By default, Delete UVWmap removes only the last modifier on object’s stack. Use LEFT CLICK to delete all the modifiers in stack. The same applies to Delete UVWXform. Can be used to directly modify the node transform, add a XForm modifier, or transform applied modifiers gizmo’s. Set constant, by range or a scripted list of values to appply the transform. Apply the transform in Grid, Local or a Reference coordinate system. To use the later mode, pick a reference node first. “+” button populates swatches with random colors. LEFT CLICK to fill unused slots. press SHIFT + LEFT CLICK for grayscale values. press RIGHT CLICK to replace all samples. RIGHT CLICK on a sample: Copy or paste color. You can change the color palette used to represent points marks, lines and other kind of visual helpers within the tools. Change the colors in the pickers or use one of the presets. Units, angles (for protractor & polar tracking) and extension spinners. Lock guides after creation toggle. Intersect All / Intersect current creation toggle. Option not available in toolbars: reference angle for rotation tools angle lock. Replace groups: By default replicator replaces picked objects inside groups and not the entire group. 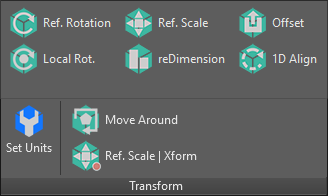 Transforms: Keep the original object standard transformations. Multi target: On by default, enables the tool to pick more than one destination object. Multi target: On by default, enables the tool to pick multiple destination objects. Main files are installed in 3ds Max’s root directory Scripts (Designtoolbox subfolder) and Plugins folders. MacroScripts files are placed in 3ds Max root directory MacroScripts folder. 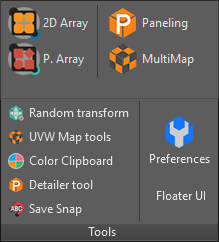 Icons are installed in the UI_ln folder in 3ds Max root directory. The ribbon extension is language dependent, it will be installed in the corresponding folder for the language selected during installation. I.E. /maxroot/EN_US is the default directory.